England head coach Stuart Lancaster is expecting a fired up Chris Ashton to push his claims for a recall for Saturday's clash with Australia at Twickenham. Ashton was forced to sit out of England's one-sided 54-12 victory over Fiji at the weekend through suspension with his replacement Charlie Sharples handing Lancaster a welcome selection headache with two of the hosts' seven tries. However, Ashton is widely expected to reclaim his place in the side and be handed the chance to add to his impressive tally of three tries in three games against the Wallabies with Sharples and Ugo Monye set to fight it out for the other wing berth. "Chris was desperately disappointed to miss this game (against Fiji)," Lancaster said. "He likes scoring tries and, if anything, this will fuel his hunger and desire to get back into the side. It was a tough lesson to learn. 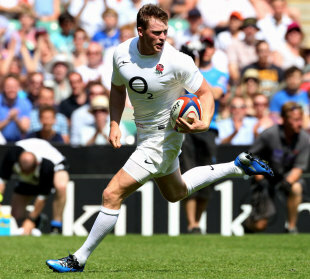 "We all know the quality of Chris Ashton. He has been one of the in-form players, both in the Premiership this season and since I have been involved with England. (Australia) are a top-three side and we recognise the quality of players we will need to beat them." Following a word of warning from disciplinary chiefs, Ashton has worked on his tackling technique and England management have stressed the need for self-control and discipline with his recent suspension unlikely to count against him. "He has done some work on this with Andy," said Lancaster. "We know his quality, he tracks the ball well and he is a great finisher. We don't ignore what he has done in the past. "There are selection decisions to be made," added Lancaster. "It's not a nightmare at all, it's a great position to be in." Sharples was delighted to notch his first Test tries in his third international appearance but does not believe it will be enough to usurp his more experienced rival. "I wasn't expecting one good performance to push 'Ashy' out when he has played exceptionally well for England for the last couple of years," Sharples said. "My goal was to do the best I could, put a bit of competition on him and also with Ugo Monye for the other wing spot. It was a good game for a wing. Our attack was firing, I got my hands on the ball and scored two tries. I was happy with the way it went." Lancaster was not getting carried away with his side's victory - well aware of the sterner challenges that await them in the coming weeks in the form of Australia, South Africa and New Zealand. "It was a good start but we recognised the quality of the opposition that is coming around the corner. We will have to step up a couple of levels next week," Lancaster said. "We will have to be at our best. We are going to have to be more clinical."